[Arkham Horror] The Tattered King: Investigator Steamroll Victory! Active. Feel free to decide Pete's turn as a group if Green doesn't show for a while. Makes sense to me. SCIENCE! will protect you from monsters, and if anything else bad happens, hopefully Mandy will save her re-roll for you. Move to Science Building, have an encounter. No problem! Frankly I am quite busy as well. If @Greenbarons doesn't reply in a day (maybe?) feel free to complete his turn. May I suggest moving to the Silver Twilight lodge and moving the sliders to either fight or lore? I am not sure what his current slider levels are sorry. He can get clues, items or an ally and items there. Sounds fine to me. I don't think there are any pressing needs that we'd need him to take care of anyway, so the Lodge is an alright place to walk him. Do you wish to move Pete's sliders? I might be able to do encounters tomorrow. No guarantees though. Mi-Go if you are struggling to get time to do this game do you want to call it quits here? I think we have this game wrapped up anyway. Just don't want you to feel obliged to keep this going. No, it's ok! It's not too much trouble running this game and I can do the encounters today. I just can't update very regularly is all. Unless you guys feel like this game is pretty much over and want to end it? I'm fine with that as well. Never know when the game might horribly screw us, but whatever everyone else wants. I don't mind playing in slow motion. I tend to presume pbp's are going to be played in slow motion; it's why I'm playing so many despite my crushing career, school, and family duties. But I also kinda expect we do have this mostly won. So if this is too much effort, I don't mind calling it. Totally willing to see it through though; you never do know, Hastur could make a sudden comeback! I'm happy to keep playing, was offering to help you out as I know you are busy. Alrighty, encounters will be up tonight, rest assured! @caliber , you can pay to take a full course of healing this turn. You have $2, not $1. I assume you will pay to heal your Sanity to full, @caliber . Let me know otherwise! The not very restless dead are now completely at rest! 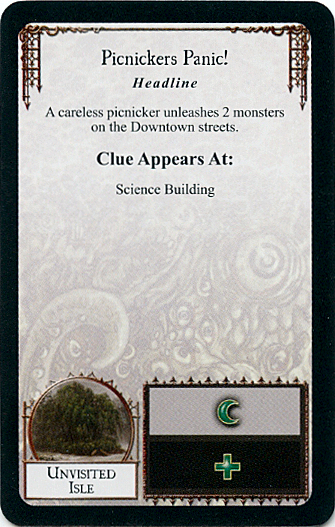 Mandy discards two gate trophies to remove the Rumor from play and each investigator shall obtain 1 spell! @caliber receives another Flesh Ward spell! @Cerberus receives the Mists of Releh! @Daemonis receives the Wither spell! @blahmcblah receives the Shrivelling spell! @Void Slayer receives the Dread Curse of Azathoth! A professor of the occult asks you to hold a hideous statue that he believes to have strange powers while he reads a scroll. Energy shoots through your body. Make a Luck (-1) check. If you pass, your spirit rises from your body and you feel that you have the power to switch bodies with another investigator. You may choose another investigator from the pile of unused investigators and bring it into play as a new character, discarding your current investigator (along with all of his items, skills, trophies, etc.). If you fail, nothing happens. @blahmcblah to make the check and undergo a bizarre change? Brushing up against a strange object in the hall, you feel stretched and thin, like your skin is too tight. Pass a Luck (-1) check or you are Cursed. @Greenbarons , what have you done? If he doesn't show up, feel free to make his roll. Added the Rumor's effects above. I'll do OW Encounters tomorrow, I'm too tired. G'night! "You see doc, then the monster turned into a ghost and pushed me outside of time and space and ..."
That's gonna be an expensive psych session. But sure, I'll pay up! Sorry I haven't done OW Encounters! Will do it later today, handtracker seems to be acting funky. A slimy monster appears! However, Kate's science prevents such a calamity from occuring! @Void Slayer must choose one of two encounters. - You run for the boat. Pass a Speed (-1)  check to reach it in time. If you do, you escape with vital information. Gain 5 Clue tokens. If you fail, stay here next turn, hiding from your pursuer. - You push yourself to the limit. Roll one die for each point of Stamina you have. Lose 1 Stamina for each die that does not roll a success. If you do not fall unconscious, gain 1 Clue token for each die that rolled a success. Keep in mind that Mandy's ability hasn't been used this turn. No rush, @Void Slayer, just notifying you again. I am going to run for the boat! I have 5 clues right now so i could spend up to 2 clues and still be able to seal this gate. Also I get 2 for 1 for speed checks! I'll spend one more clue to get 2 more dice. Big ol' goose egg (0). Should I spend another clue or can I use the reroll, which will be 4 dice? If I am gonna seal that gate I might need that extra clue. The pool of water was surrounded by dark grey basal stone, it looked carved out of solid bedrock, but covered in abominable symbols that hurt the eyes just to glance at them. A shape broke the surface, a white arm and colorful evening dress out of place n the gloom, gasping for air, arms flailing wildly in panic. Gloria managed to swim over to the edge of the pool, she fumbled against the slippery slopped edges of the pool, trying madly to scramble up. With a loud smash she hit her trusty fire axe into the edge, the friction enough for her to haul herself out from the gaping maw of the earth. Covered in the inky black water from head to toe she shook like a dog, holding her arms in around her body and shivering. Suddenly thought reemerged from the recesses of her panicked, almost drowned mind and she tore off her purse and upended it, several small fish flopping out and a small, leather wrapped package hitting the floor. She scooped it up quickly and examined the twine, still tied tight around the notes she had found on the body, so deep in this accursed island. How the poor soul had gotten here she could not know, but he had somehow translated the words written in this place, amidst his mad ramblings about the end of the world. "Poor soul?" She asked out loud and with a sigh "Might as well be thinking about myself." As if on cue a loud howl was taken up, echoing through the lost city. Anguished and bitter were the only two ways to describe it, besides the most useful, far away. At least she hoped. She crouched down and scuttled over to a corner in the cavernous room, hiding in a shadow as the howling continued for some time. Like an animal, but she could parse out distinct word clusters, if she only knew what they meant. The howling stopped suddenly, startling her as much as when they began and she looked up and immediately regretted it. She stared directly into the only exit from this place besides the watery deep she had just escaped from, a hexagonal doorway leading into a hallway. An impossible hallway, what should have been strait lines twisted in on itself as though the whole place had been spun far too fast. She nearly toppled over from the sight but looked down quickly. And that was probably what saved her. "NO!" she cried as she saw that the numbness on her feet was not from fear or cold, but from the rising water from the pool. She could sense in it a malevolence no simple chemical should have. All the fury of the oceans was in this small pool, rising out, to swallow her up, angry at being denied her the first time. A look up again at the passage, a few quick steps forward. No matter what impossible geometries lay on the other side it could not be worse then this. And there was the boat, a fishing vessel probably, not two feet from the edge of the doorway, a sudden drop-off into the ocean. She could not believe it, was this place somehow toying with her? And with a blink it was gone, even as she crossed the distance to the portal, again a maze of twisting lines. She closed her eyes and walked through. It would be safer this way, she hoped. Okay, I'll use the reroll, 4 dice, 2 success. That should be 9 clues, I can seal the gate. Sorry guys, will update when I can. This week's exam week and it's been a lot. Bear with me! Good luck with the exams mate.  I will have an update by this Saturday, that is guaranteed. Sorry guys! I will update the board tonight. A gate opening fizzles as it bumps on an Elder Sign! The Cultist in the Sky moves to assault Mandy! A Gug and a Mi-Go appears in Downtown Streets! Bob Jenkins in the Science Building receives a clue. Board incoming!